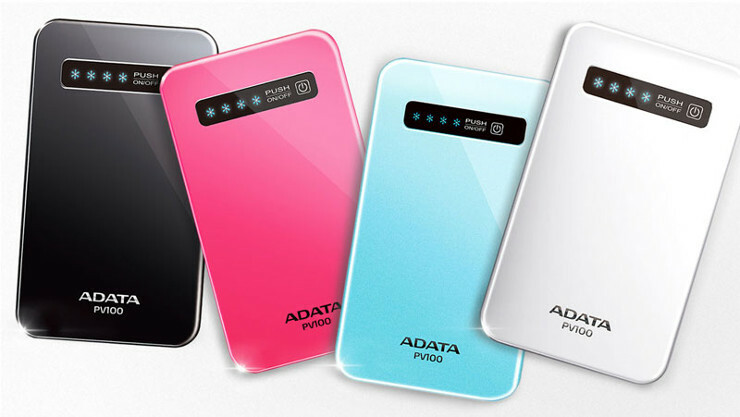 Taipei, Taiwan – January 7, 2014 - In response to the increasing usage of smartphones and tablet computers worldwide, ADATA Technology has announced the launch of the PV100 power bank. The PV100 is an 8mm ultra-slim device charger with a robust 2.1 Ampere output, designed to meet the omnipresent need for power of the current generation of mobile devices, while still fitting comfortably in a pocket or purse. Equipped with an LED power indicator button that displays the charge level of the Li-polymer battery, the PV100 has a capacity of 4200mAh. It can quickly charge almost any microUSB powered mobile device. The PV100 has obtained FCC, CE, LVD, PSE, C-Tick, KC, NOM, and Gost-R certifications, ensuring safety and stability over long-term use. Additionally, the PV100 features a wide range of protective features, including overcharge/discharge protection, overvoltage/overcurrent protection, and short circuit protection, all of which ensure maximum safety at all times. Battery temperature is monitored by the negative temperature coefficient (NTC) gauge, preventing overheating damage to the battery and to the power bank. Available in colors of black, white, blue, and pink, the PV100 will provide users of smartphones and tablet computers with the power necessary to stay connected in an increasingly mobile world. The PV100 Power Bank will be available soon through selected retailers and distributors.